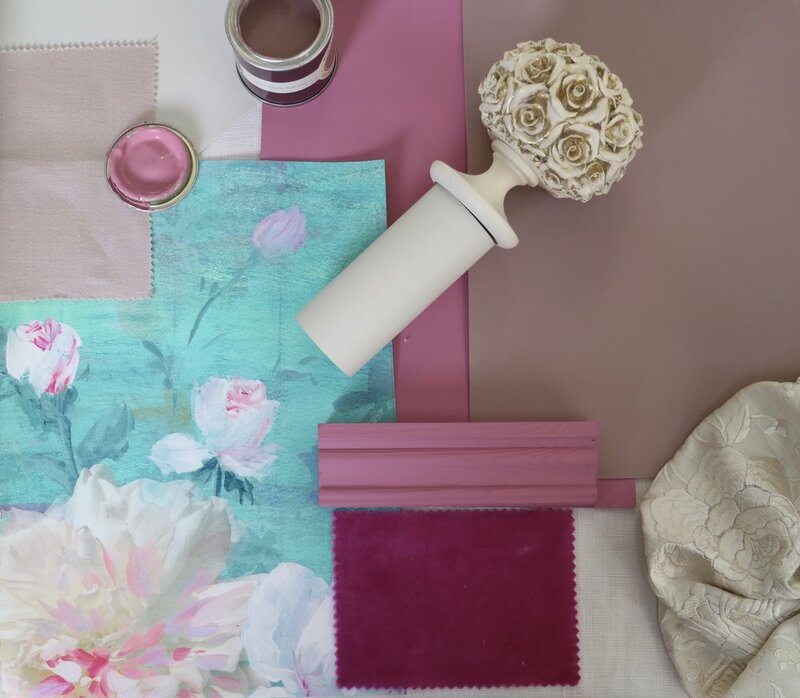 In our previous post we shared the 2 delicious new pinks – Rangwali and Sulking Room Pink – from Farrow & Ball. Here we show you how to use these with our beautiful Valerie design to create a timeless, deeply romantic and feminine scheme. 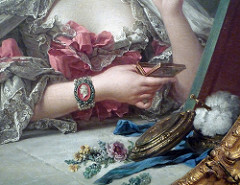 The alluringly titled ‘Sulking Room Pink’, named after the French ‘bouder’ to sulk, transports me into the world of the 18th Century boudoir of Madame de Pompadour. To the world of intrigue and deception carried out from behind the fan, the rustle of heavy skirts and of tiny feet encased in silk and bows. It is a wonderfully muted rose, warm and gentle, with a vintage-feel. Used alongside ‘Valerie’, its softness creates a harmonious balance with the bold aqua and vibrant colour-pops. ‘Sulking Room Pink’ is very versatile and can be used on its own for the most delicate and traditional look, or with a dark dramatic accent to create something really unusual. ‘Rangwali’ is a much more vibrant, hedonistic pink and by adding it as an accent colour, it brings out the bubble-gum pink from within the ‘Valerie’ design, but certainly does not overwhelm it. If you wanted to create a more contemporary scheme, you could drop ‘Sulking Room Pink’ and only use ‘Rangwali’. The look would be much more intense and vibrant and more suited to a Maximalist’s palate. Our chosen neutral is ‘Shaded White’ from Farrow & Ball; a gentle grey beige, this works well with the warmth of the pinks and enhances the comforting nature of ‘Sulking Room Pink’. ‘Valerie’ is timeless, with traditional motifs of butterflies, peonies and roses rendered contemporary by the inclusion of photographic flowers from my late-mother’s garden and by the wondrously joyful accents of bubble-gum pink and vibrant orange. When I conceived this design, I was hugely influenced by French 18th and 19th century pattern design and painting. Throughout my childhood, my mother, after whom this design is named, exposed me to the French decorative arts, their furnishings, textiles and the porcelain of Sèvres, Limoges and Vincennes. My mother had worked at the Victoria & Albert museum before my brother and I ware born, and I practically grew up in the place, indeed I owe it my name. We also moved to Paris when I was little and devoured their museums and decorative interiors. Later in life my mother went on to set-up a high-end antiques business, sourcing exquisite 18th and 19th Century porcelain, chandeliers, mirrors and other decorative pieces from France and England. I often accompanied her on buying trips and so her love for, and deep knowledge of the decorative arts was something I simply absorbed throughout my life. She also held a romantic view of Marie-Antoinette and the Empress Joséphine, which has obviously rubbed off on me. 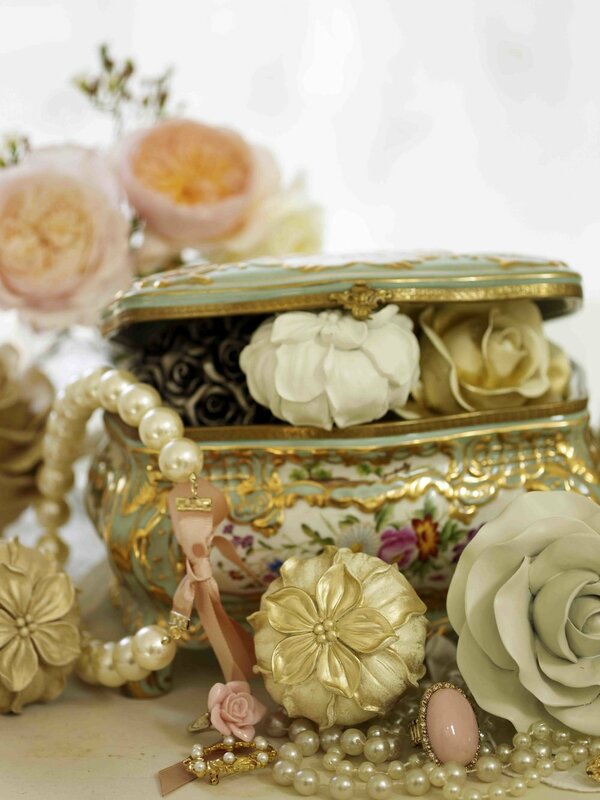 This inspiration is never more evident than in ‘Valerie’, and ‘Fleeting Magnificence’, which are both incredibly romantic designs, featuring flowers inspired by 18th and 19th century porcelain, the illustrations of Redouté, court artist to Marie-Antoinette and the Empress Joséphine, and romantic painters such as Boucher, Fragonard and Winterhalter. Dressing such a romantic and feminine scheme, whilst keeping it contemporary, requires a careful mix of modern and traditional elements, unless you do want to recreate an 18th or 19th Century interior. Windows are best dressed in a dreamy, romantic way, with soft billowing curtains creating a slight puddle on the floor. Choose our ‘Valerie’ design available on 4 fabulous base cloths, sumptuous British cotton velvet, pure Irish linen, cotton sateen or our Irish linen union, (click to learn more). Use an unapologetically pretty curtain pole and hold-backs from, London-based, Byron & Byron, whose ‘Floral - Romantics’ range cannot be surpassed for its femininity. This range comes in 8 finishes, but if you can’t find the one you want you can commission a bespoke colour. I cannot image how heavenly one of these finials would be in either of the new Farrow & Ball pinks, with a touch of gilding. With Byron & Byron you can also order bespoke hold-backs so that you can really accentuate the floral detail, see above for one we created for a client’s dressing room in West London, through our sister company Victoria Hill Bespoke Soft-Furnishings. Work in some contemporary styled furnishings and cushions in velvets and silks, such as this ‘Zeppelin’ chair from Sofa.com, covered in luscious Peony velvet, or silks in dreamily muted shades of pink and champagne from fabric houses such as James Hare (on the moodboard). Add a vintage-style boho light like this large Japanese lantern from Rockett St.George with brass coloured details. Metallic accents work really well with the warmth of ‘Sulking Room Pink’, especially brass and gold which also look wonderful with gilt curtain poles and hold-backs and allude to French decorative gilt 18th and 19th Century furnishings. 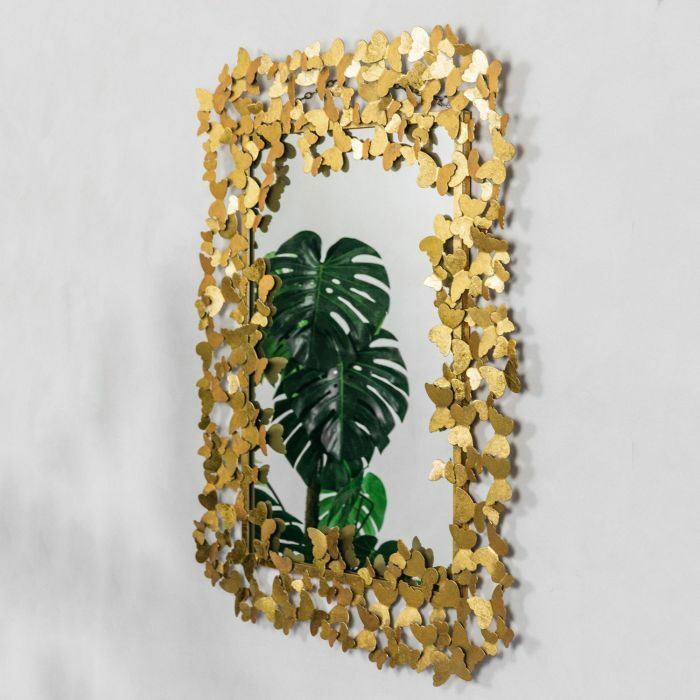 Pick furniture and accessories like this marble and brass side table, again by Rockett St. George, or this substantial gold butterfly mirror by Graham & Green. Mixing these classic contemporary elements alongside the vintage colour scheme will help you achieve that eclectic look that so many people are after. The overall look is dreamily feminine and romantic, but also grown-up. There is nothing saccharine or old-fashioned about this scheme, it is simply timeless.